In our last discussion, we discussed the value of implementing a marketing automation system (MAS). But like any tool, a MAS only works well if used well. In order to reach the goal of continuous revenue performance management (a Marketo term), your company’s management and sales force must understand and embrace the system’s functionality. 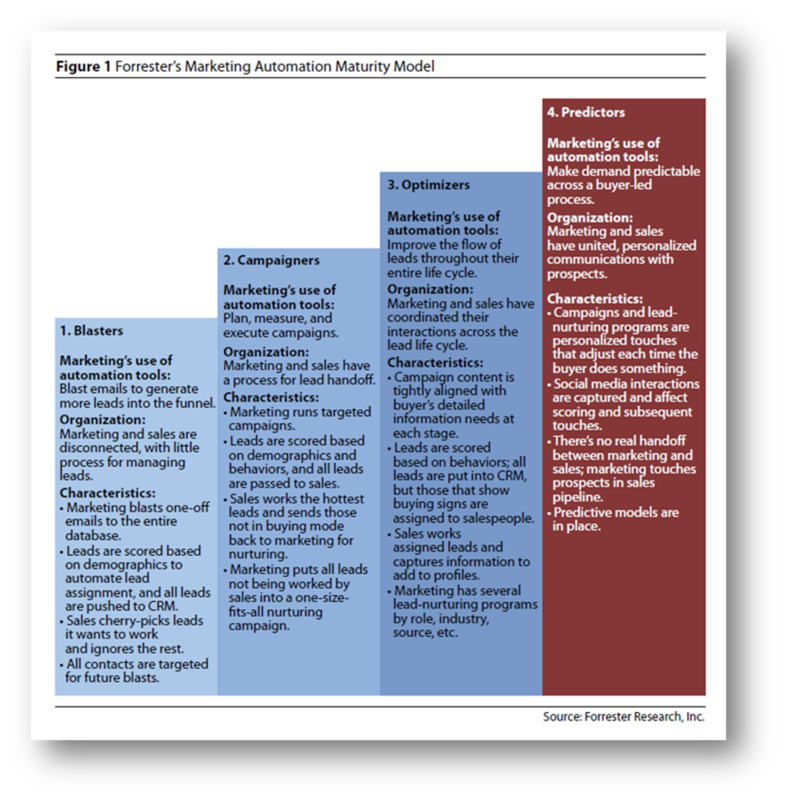 Here is Forrester’s view of the marketing maturity journey, which shows how marketing and sales evolve together. IT – Work through processes, procedures, charters, documentation, approval tiers, security certification, risk & compliance, etc. Figure out how to manage all the work you’ve created for yourself! see Marketing as part of their pipeline – the partner that is sending them highly-qualified leads and equipping them to close the deals. Only when Sales and Marketing hold hands does the whole process come together. This entry was posted in B2B Marketing, Content Marketing, Digital Marketing, Uncategorized and tagged B2B Marketing, Content Marketing, Digital Marketing. Bookmark the permalink. Thoughtful, insightful and cutting-edge as we have come to expect and enjoy for Lorena!